At the dentist’s office yesterday I read a nice article in Fortune about Toyota’s return to glory. The story highlighted the company’s leader, Akio Toyoda, and his management strategy, which has gotten Toyota back on track after a horrendous spell of bad luck. Of course, the article spent plenty of time discussing Toyota’s perception as a transportation appliance, its traditional lack of styling and how it is working to overcome those perceptions. It was actually an inspiring story about a proud Japanese businessman humbled by recalls, quality problems, devastating natural disasters and a steep decline in sales and production of its vehicles. What the article never mentioned is the good Toyota wants to spread by giving away some if its cars. A hundred cars is nothing compared with the 8 million vehicles produced by Toyota every year. To a single non-profit organization, though, a vehicle can provide needed mobility to serve more people or raise cash for its cause. Giving 100 nonprofits the opportunity to continue making a difference is an admirable effort, and one that Toyota hopes to accomplish in its second run of a program it calls 100 Cars for Good. Toyota’s first round of the program was a wild success and provided cars to help a soup kitchen in New Jersey serve more people, helped a Detroit program provide horseback riding to kids with cancer and helped a North Carolina organization train and transport service dogs to wounded veterans. 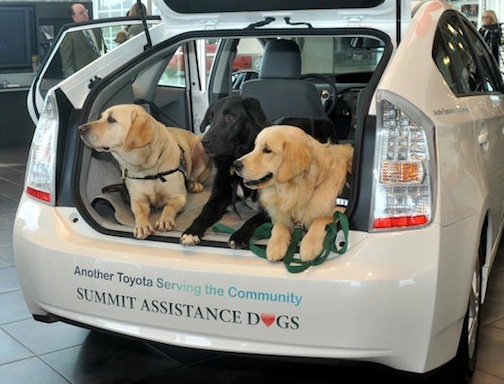 Now Toyota wants your help finding the next 100 nonprofits to benefit from its program. Just direct the organization closest to your heart to the application page, and it could be one of the next to benefit from one of 100 vehicles Toyota will give away. In the face of all the adversity the company has faced over the last 18 months, this is a pretty admirable campaign that can make a real and measurable difference. What organization would you nominate to receive one of Toyota’s 100 cars? This entry was posted in Car Industry News, Car Minded, Foreign Cars, General Chat, United States and tagged 100 cars for good, Akio Toyoda, Toyota, Toyota charities. Bookmark the permalink. I saw an article about a Miami dealer charging $7K OVER MSRP for the Prius C, making it an almost $30K car. What a joke. Dealers lose so much respect when they do this. Randy, did you experience that or have to negotiate around it? That would be cool, although I’m not sure the CV transmission could handle the torque. I was surprised at how well the car drove. Congrats randy! Should be a great car. You know what be cool? If Toyota could put a little diesel into the iq. I’m curious to hear what trim you chose, your driving impressions, what you especially liked/disliked and if you were offered a paltry discount or did you have to pay sticker price. I’m down to the Prius c and the new Subie XV Crosstrek which arrives way too late for me to wait much longer. Thanks. We ordered the car today. “She who must be obeyed” liked it very much I think Toyota has produced a real winner, getting a hybrid into the high teen/low twenty price range. I also test drove the new Scion Iq, which is not much larger than a SMART but rides and drive about 1000% better. That looks like a great urban car, especially for the young folks. Very cool, randy! Let us know how the test drive goes. Yep, I’m taking my wife over for a test drive of the Prius C today, and if she likes it, we’re buying one. I nominate CHANGE, Inc. Its mission statement encourages the integration of services, the building of partnerships, and consolidating of resources to empower families towards healthy self-sufficient living. Christians Helping Arrange New Growth Enterprises, Inc. was established by the Weirton Ministerial Association in 1983 for the sole purpose of addressing the concerns of the workers laid-off from National Steel Corporation’s Weirton plant. Since that time, CHANGE, Inc. has evolved into a private, non-profit Community Action and Community Health Agency that provides a variety of programs to individuals and families residing within the Northern Panhandle of West Virginia, and surrounding communities in Ohio and Pennsylvania. Using your own description of “what we want”, I strongly re-suggest a drive of the new Prius c. I drove it last week and by Jove, it fits your description to a T. I’m 6’3″ and 220 pounds and fit quite comfortably in it and even though it is a little pokey on the 4 lane, it serves its purpose quite well in city driving. Has everything that I wanted without all the distractions we both hate. Check it out and see what you think. My first choice would be Visiting Nurse Association of Oakland County, a local nonprofit group that provides a wide variety of health care and hospice services. Their hospice unit worked with my father when he was dying from cancer and everyone who helped was truly inspiring. Given that their services are largely home-based, I’m sure a car would be helpful. As for Toyota, the company didn’t have a “horrendous spell of bad luck.” (other than the terrible effects of the earhquake and psunami). Toyota USA’s quality meltdown is a good example of what happens when a company allows lust for short-term profits to overcome the culture they worked so hard to build. No doubt they allowed a few too many American car company types into their organization. The 100 cars is a good program and I hope they will reestablish their complete commitment to quality and value. Toyota has been successful largely because most of us DO NOT WANT exciting styling, we want reasonably priced cars that don’t break down all the time, including highly fuel-efficient cars that don’t cost a king’s ransom. ← Mulally’s Pay: How Much Is Too Much?